Someone on an online forum recently wrote words to the effect of “Do you literally fight with you hands in a chamber position?”. To me the real question is: "Do you mean to say you DON'T fight using a chamber?" If you don't, you'd be one of a very few! What do I mean by this? Everyone - boxers included - use chambers. Chambers are nothing more than loading for a punch, in particular a punch that you wish to execute with power (ie. not a jab). Now this next point is critical: To view chambers statically is a mistake. It is as much a mistake as taking a snapshot of a jump and asking “Do you literally hang in the air during a fight?”. Chambers occur in a fraction of an instant in the context of continuous movement. But they nevertheless occur in every fighting discipline. If you don’t chamber your punch (ie. load it at all) then you must be peppering your opponent with little jabs and nothing more. No one does this, as far as I know. 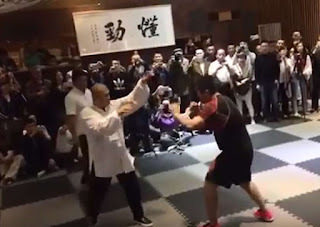 Instead all disciplines contain jabs (kizami zuki in karate) and power punches that require chambers (in karate terms, the choku zuki or the “kosa zuki” – more on the latter in a second). There will be many who will nevertheless argue: “But the hand should just move from wherever it is." Quite right. But question remains: "Where will your hand be?" 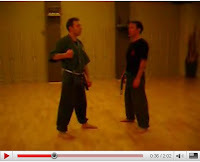 I am sure that you will agree that when you are fighting/sparring your hands move to many positions depending on your deflection, evasion and even counterbalancing. You won't punch with a hand that is wrongly placed. All the chambered punch does is place your hand in the ideal place for hitting with power. You might or might not have the chance to use a chamber (classical or otherwise). That is a matter for your training (ie. 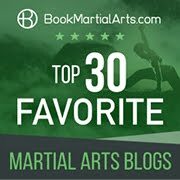 whether your timing and placement allows you to land power punches - punches that have been chambered to allow your punch to reach maximum velocity). 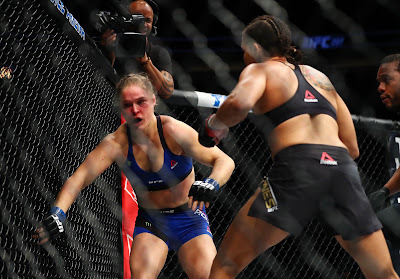 Boxers/MMA etc typically tend to load for power punches such as the right cross. Consider the pictures (above right) of an MMA fight and note “loading” of the punch. What you’ll see is that the punch is loaded just above waist level with the elbow away from the body. Then the fist is raised and the punch is executed. 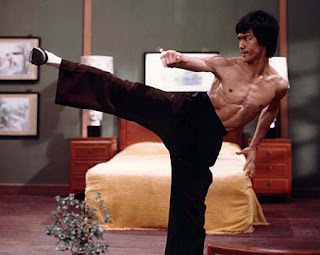 This is what I call a “kosa zuki” or “cross punch” in karate terms. Why? Because it passes through the hypotenuse of the triangle formed by you, your opponent and your right hand. In other words it “crosses” your (and your opponent’s) centreline. It might seem like a completely different chamber (and punch) from the standard karate “choku zuki” but it isn’t. It is really quite consistent biomechanically. 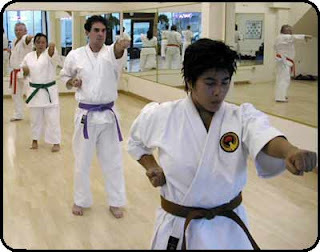 Consider the pictures and video below: The karate chamber occurs with the elbow at the waist. But the chamber can easily be altered to a “boxing-style” chamber just by raising the elbow in an arc away from the body. 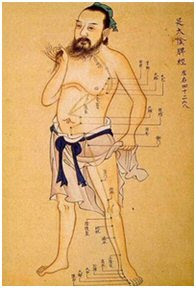 It is important to note that any chamber along that arc from your waist to your ear is effective and useful, albeit in different circumstances. When you raise your arm to the side, away from the body, your palm will turn further and further over until it is facing down when your fist is near your ear. Accordingly you lose the "corkscrew" aspect to your punch. However you also gain in that you are able to throw more of your bodyweight into the punch. Most importantly, the hypotenuse of the triangle I referred to above is longer than the line going directly from you to your opponent. Accordingly your punch has more time to accelerate and can reach a higher maximum velocity on impact. 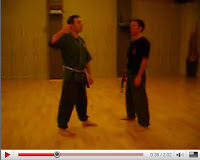 For these reasons the kosa zuki / right cross is more powerful than a straight thrust. It is simple physics. 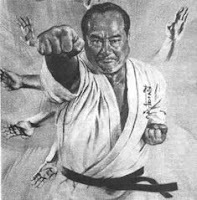 You’ll see that Morio Higaonna uses a kind of kosa zuki in punching the makiwara in the video embedded below from the BBC television series “Way of the Warrior”. Why? 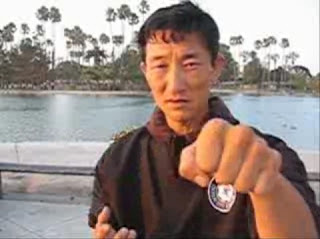 He is practising power punching. As I said above, there is a time and place for every technique, and so different chambers along the arc from the hip to the ear are acceptable variations and I have practised them accordingly. An “away from the body” chamber is not a corruption of basic technique - it is an acceptable variation. 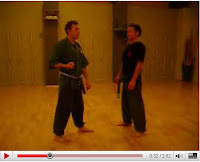 However it is also true that in executing a kosa zuki your punch is more easily seen and avoided/deflected. In other words, it is more highly telegraphed in the lead up. Furthermore you leave a much bigger opening during its execution. I’ve tried using it in sparring and I’ve been picked off more often than not. It is for these reasons that knockouts between evenly matched boxers are not “dime a dozen”. A clean knockout is the exception, not the rule. It is hard (and dangerous) to simply “go for the big punch”. Most boxers will generally “loosen up” their opponent with body blows and jabs, and only unleash a massive right cross at the right time – usually when the opponent is reeling. This is the classic finishing blow. Morio Higaonna in "The Way of the Warrior"
Going on my experience as a prosecutor, many (if not most) street attacks are perpetrated by untrained people. So if anything they go for an simple swing/haymaker. However many will attempt some kind of “right cross” and chamber accordingly. 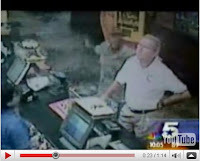 So it’s no surprise to see “loading” or “chambering” patterns (however inept) in surveillance video. 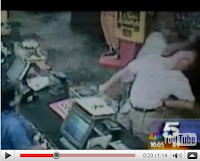 Consider the swinging “chamber” of this particular coward hitting a patron at a service station while the patron is completely unaware of the impending attack (what is known colloquially as a “king hit”). The particular victim suffered some nasty injuries, but thankfully not as bad had the punch been executed correctly. 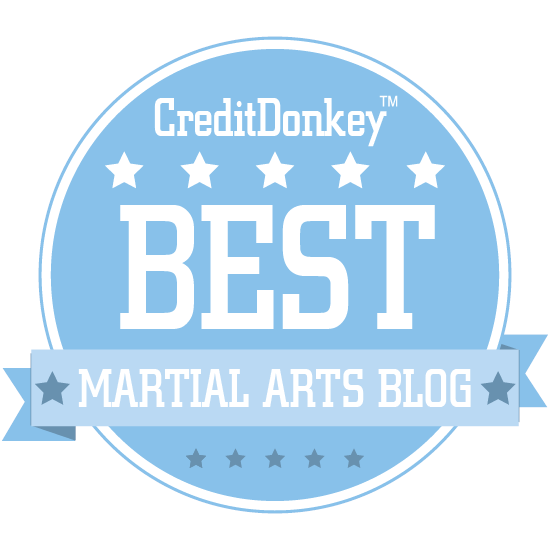 So I return to the forum comment that started this article (“Do you literally fight with you hands in a chamber position?”). I think what the correspondent meant to ask was: “Do you literally fight using a full traditional chamber?”. As it happens yes, I do – although it might not be quite as neat as my basic technique in the dojo. But do I load for a straight punch? Sure! Even some MMA practitioners use the traditional chamber. Take a look at these pictures of “Lyoto” Machida. In both of them Machida can be seen chambering his next punch at his hip. Is it neat, like a chamber practised with basics? No – but then again the chamber in basics practice is an ideal and we all know that ideals don’t occur in combat. We train with ideal movements and settle for the best we can bring out at the time. Put another way, there’s no point in practising a half-baked chamber in the dojo. 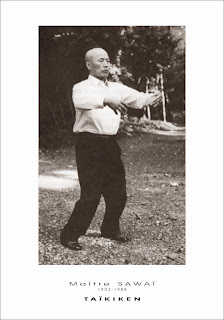 I might not use the exact form (the “xing”) of a basic movement, but I use it's "essence" (“yi”) - what it has taught me about power transfer along a straight line, about focus etc. Accordingly chambers have an inherent value - for training if nothing else. My Sensei has called his school Wu-Shin (meaning literally 'no-form'). The idea is that form or structure is essential for a purpose, but once this purpose is achieved the form can be abandoned. 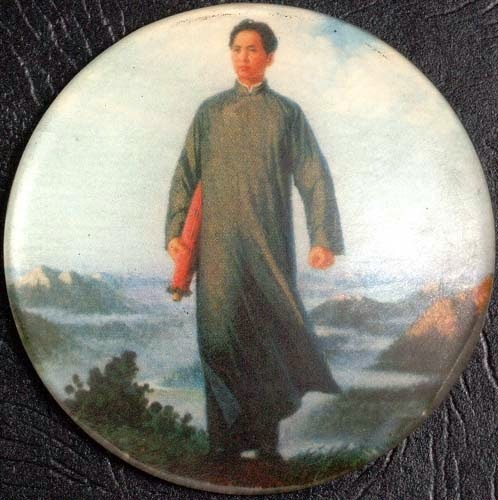 You can see this thinking to some extent in the more relaxed pullbacks of the internal arts, being (in his and my view) an advancement on the hard or external arts. In other words the relaxed (often lower) pullback is indicative that form is being relaxed as a precursor to total abandonment. I’ve often heard eclectic stylists saying they have abandoned traditional form because they believe it limits them. Instead I think they are limited by having excluded valuable paths of learning. Leaving basic training aside, my fundamental point is that chambering is a necessary part of fighting, just as pulling back for a groundstroke is part of tennis. A combat chamber might not end up looking like a basic, nor will a fighter often have the luxury of a big, protracted wind-up (like in tennis). But punches are nevertheless “loaded” to generate power. To say otherwise is completely misconceived.